As a regional contribution, we are supporting "Animal Supporter System," which was newly established by Oji Zoo of Kobe in 2005. Here we introduce this popular excursion spot with small children, focusing on the cuddly animals as well as the large animals and the recreational area in the zoo as recommended spots for families. All of the staff at Ryuusenkaku are eagerly waiting to serve the many visitors from around the world coming to the Kobe-Arima Onsen. We recommend taking the family around the various facilities such as the "Animal and Children Country," a petting zoo where cuddly animals such as rabbits and goats can be actually touched, the Fierce Animal Coliseum, where large-sized fierce cats such as tigers and lions can be observed through glass windows, and the Animal Science Pavilion, a place to enjoyably learn about the ecology of animals through the theater facilities. In addition to the recreational area within the zoo with its Ferris wheel and train for small children, there is an actual steam locomotive D51 on display. The zoo is also well known as a popular place for cherry blossom viewing. Take the Hankyu Railway and get off at Oji Koen Station. Walk 3 minutes west from Exit 3 or take the JR and get off at Nada Station and walk 5 minutes north. Depending on the physical condition of the animals, some animals may not be available for public viewing. 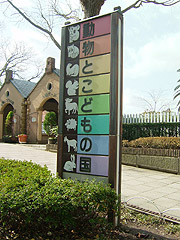 An Animal Supporter System was established at Oji Zoo in 2005. Companies, organizations, and individuals can assist and support the management of zoo as animal supporters. Since Oji Zoo is near Arima Onsen, there are many guests that visit Oji Zoo. As a corporate supporter of the Mandrill of Colobus Monkey Family, Ryuusenkaku is proud to be a member of the Animal Supporter System. When you enter the front gate of the Oji Zoo, there is a large flamingo pond. Visitors are often overwhelmed in admiration from the sight of a flock of vividly colored pink flamingos. To the north side of the flamingo pond, there is a Japanese style rest place called "Mori no Yakata". On the left-hand side of the rest place, "Animal and Children Country" is stretched before you. Here there are many attractions such as the "Koala Pavilion" and the Forest of Squirrels and Small Birds, which you can go through, and you can observe the fun-loving behavior of small animals such as koalas and red pandas in close proximity. Other than the sheep and goats roaming freely in the pasture at the Animal Petting Area, there is also a corner where visitors can hold rabbits and guinea pigs. Bright and spacious, this is an easy-to-see breeding farm. The Oji Zoo cares for the Queensland Koala, which is the smallest of the 3 subspecies. Since the fence is made of transparent glass, children can easily see the outdoor exercise area surrounded by cliffs and forest. There are two Sichuan Red Pandas at the zoo: Yan-yan, a female born in 1985 and the oldest living red panda in Japan, and Taro, a male red panda. A red panda at the Chiba City Zoo called "Futa" has become popular all over Japan for being able to stand upright for about 30 seconds. By nature, a red panda has the ability to stand for brief intervals when it is unsure of its surroundings. This facility reproduces the ravine of the Mt. Rokko mountain ranges. A walkway, running through the central part of the a cage, allows visitors a chance to see such animals as Hokkaido and striped squirrels along with various small birds such as the Bohemian Waxwing, Bullfinch, and the Blue-and-White-Flycatcher. You will not get bored watching the various movements of the nearby squirrels with fluffy-tails using their small paws to dig holes in the ground to bury nuts, jump from tree branch to tree branch, or make a spectacular ascent by climbing a vertical wall. The striped squirrel is readily seen in the winter while the Hokkaido-Squirrel is active even in winter. As you walk and see the small birds bathing in the small brook, you will get the feeling of a forest bath. There is a corner where domesticated ducks, Patagonian cavies, goats, and sheep freely roam and visitors can hold guinea pigs and European rabbits. To the north side of the rest place called "Mori no Yakata", there is a Giant Panda Pavilion. The site for the Giant Panda Pavilion spans an area of 1,253m2 with 2 outdoor exercise areas, 4 bedrooms, a breeding room, and a bamboo storage room. There is even a weighing scale which is necessary to maintain the health of the pandas. When a panda gets on the scale, the panda's weight appears on a digital display. Pandas mate only once a year with only a short time when fertilization is possible, so it can be said that it is a difficult species to promote propagation. A glass plane allows visitors to observe both the land and water to observe the dynamic scene of the two polar bears excitedly jumping into the pool and watch them frolicking together. To the right of the polar bear pavilion, there is a sea lion pond, where the Californian Sea Lion is found. The facilities have been designed to enable visitors to plainly observe the sight of a group of sea lions swimming in the spacious pool or lying on land, which has been recreated with boulders and trees to match the sea lions' natural habitat. When we progress further north from the Sea Lion Pond, we come to the Animal Pasture Pavilion where various species of the monkey family reside with such attractions as gorillas, orangutans, chimpanzees, and mandrills. Even though they are the largest and most powerful of the ape family, gorillas are sensitive animals, forming families and doting on their children. Orangutans reside independently in the trees of Southeast Asia in the sub-tropical rain forests. The name orangutan means "the person of the forest" in Malay. The primary chimpanzee diet consists of fruits, seeds, tree leaves, and insects, but they will sometimes use a thin reed to get honey from a nest of ants or bees and lick the food off the reed. Chimpanzees have also been known to attack the offspring of other chimpanzees. In captivity, advanced chimpanzees have demonstrated a level of intelligence on par with the level of infants. To eat tree leaves, the Colobus genus have large molars and a large stomach divided into several compartments. The face of an adult male mandrill differs from the female and resembles the face of a Kabuki actor with its vivid color being a distinctive feature. ※ Ryuusenkaku is a corporate supporter of the mandrill. Distinctive for its ability to largely expand its throat sac, the male uses its throat to emit a loud cry while the female can continue crying out for a long period of time. Their distinctive cries are a means for the male and female to communicate. On the left of the Pasture-type Pavilion where the monkeys reside, you will see the Sun Animal Pavilion. Here there are three completely different groups of inhabitants from the tropical rainforest: sloth, bat and crocodile. The sloths spend most of their lives alone hanging on a tree branch. With necks that twist to around 270 degrees, they have long, pointed claws shaped like a sickle as a weapon. With 951 varieties the bats are second only to rodents in number of species. With their diminutive bodies, they have an ability like radar that sends out ultrasonic waves. Often making homes hidden in caves, they also use the collapsed walls of old temples and cracks in rocks and trees to hide. They live in the basin of the River Nile and can become 7 m long in length. Known for their violent-temper, they sometimes catch large mammals like gnus and pull them down into the river. These animals live in the northern part of South America and on the eastern side of the Andes Mountains. Their diet consists mainly of fish and shells. These reptiles live in the rivers and marshes of the tropical rainforests on the islands of Sumatra and Borneo. Their primary food consists of fish. As you proceed further to the north end of the zoo, there are a large number of animals eating grass. Grass-eating animals are divided into two orders - Antiodactyla and Perissodactyla - and classification is determined from the shape of their hooves. Giraffe sleep while standing, and when they sit their necks remain upright. The giraffe has the strongest heart of all the animals since blood must be pumped up to an elevation of 3 m from heart to head, requiring the blood pressure of a giraffe to be twice as high as any other animal. During the mating season or after a calf has been born, the adult hippos cry out in a voice similar to the neigh of a horse. Weighing between 2000 kg to 3500 kg, Hippos are doting parents and closely guard over their children. These animals belong to the family Camelidae and are also referred to as American camels. In the highlands of South America, llamas are domesticated animals used for transportation of goods and a source of wool. Living in groups in the dry plains of semi-desert regions, Grevy's zebras are the biggest of the zebra species and stand out with their beautiful fine stripes. These animals reside in the dry savannas. While weak in eyesight, they have a strong sense of smell and excellent hearing with tube-shaped ears being capable to freely change direction. Native to the inland regions of Australia, red kangaroos can hop at a rate of 45 km/h. Gestation is about 33 days, and a baby stays in its mother's brood pouch for about one year. Ostriches inhabit the semi-desert and savanna regions and are considered the largest living species of birds. Their stout legs enable them to run at speeds of 50 km/h. After seeing the grass-eating animals, proceed to the south side and you'll find the Animal Science Pavilion and Recreational Area/Restaurants. Further south, there is the Elephant Pavilion where Indian elephants reside. These elephants are smaller, are more mild-tempered, and have shorter tusks than African elephants. The tusks of the female elephant are so small that you may not see them. They have a protruding forehead and large head with a highly developed brain. In Southeast Asia and India, elephants are kept in captivity and assist people in daily activities. There is a round building south of the elephant pavilion where large fierce animals of the family Panthera reside within a nurturing environment including trees and rocks similar to their native land. Visitors can see their type of life through a glass wall. Lions inhabit Africa and parts of India where they form packs. They feed on large, grass-eating animals. It is widely said that male lions do not work, and it is the female lion that hunts in packs. These animals have the biggest body among the family Panthera and weigh over 300 kg. They hunt big grass-eating animals alone. In the ancient Maya era, jaguars were revered as a god. Dark-colored, rose-shaped speckles adore their backs and a black ring is visible at the tip of their tail. These felines live in the highlands at an altitude between 2000 to 6000 meters. When night falls they hunt for wild sheep, deer, mice, and birds. They have rounded tails and are covered with a thick coat. On the north of Recreational Area/Restaurants, there is "Animal Science Pavilion", with a permanent exhibition room, a special exhibition room, a lounge, a library, a video corner and a hall. Skeletal specimens of elephant and giraffe are also exhibited. Life and characteristics of wild animals can be observed for your enjoyment. From the lounge, you may also enjoy watching penguins swim. The residence was built in 1889 and is now preserved as an important cultural property of Japan. It is the largest of the foreign residences still in existence in Kobe and is considered one of the most beautiful examples of Western style architecture of the Meiji era. The D51 steam locomotive is exhibited in front of the exit for Animal Petting Area. This model of train was manufactured in large quantities and used mostly for transportation of goods. On the north of flamingo pond, there is a free, quiet Japanese-style rest place with air conditioning. "Mori no Yakata " means Forest Villa. 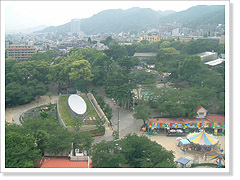 This is a playground for children with many rides such as a train, merry-go-round, roller coaster, animal Ferris wheel, Go Go! Anpanman, Locomotive Thomas, and others. With the exception of 3 special rides costing \300 each, the fee for one ride is \200. There are two restaurants and shops awaiting your visit. "Motoyu Ryuusenkaku - Arima Onsen"